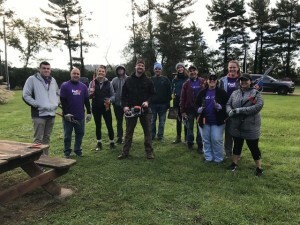 A group of 12 volunteers from FedEx Ground Strategic Planning Department braved the chilly fall morning to help Chartiers Center with some grounds keeping work at two of our program sites. Volunteers came prepared with work gloves and landscaping tools. Work included trimming trees and bushes, weeding, laying mulch, weed whacking, and more. 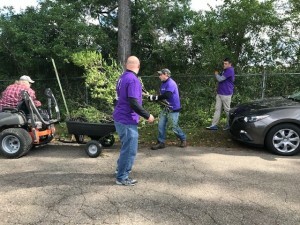 Chartiers Center’s maintenance staff is responsible for maintaining all the Chartiers Center properties in the South Hills, and was extremely grateful for the volunteer help from FedEx Ground. In the afternoon the work continued outside while a small group of volunteers went inside the residence to socialize with the senior residents. 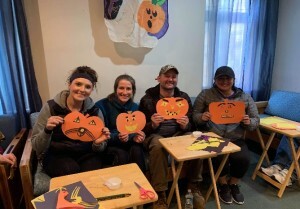 Inside the activities included hanging Halloween decorations and making pumpkin crafts. The pumpkins were then displayed for all to see. The residents were thrilled to have visitors and shared Halloween themed jokes. It was a great time had by all. 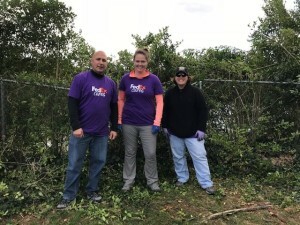 Chartiers Center appreciates the support provided by the FedEx Ground Strategic Planning Department volunteers. They are also prepar ing a chili-cook-off to benefit Mary’s Ma rket. More to come.